If getting a basketball sublimated hooded long sleeve shirt has been on your mind, you’ve come to the right place. We love these shirts and think all players of a teams should own their own. They’re perfect for warm-up sessions before a big game, great to wear during practice, and even to wear when you’re on your way to a game! There are so many upsides to having a basketball sublimated long sleeve shirt. The first is that it is comfortable. It gives you freedom of movement, lets your skin breathe properly, and it doesn’t weigh you down. Even if you’re traveling a long way to meet your adversaries, you’ll feel comfortable wearing this hooded shirt. The second advantage is that you get to customize it. Is there anything that screams “professional team” more than matching personalized shirts? We don’t think so… Thanks to our innovative printing process, you can fully customize your basketball sublimated long sleeve shirt. You can request the shirt to have your team colors, logo, and even name! Having a personalized team shirt doesn’t just look cool. It also tells your competition that you mean business and are at the same level as professionals. Not to mention that it boosts team morale and gets everyone pumped to give their best on the field. All shirts are available in a range of sizes: from YXS to A4XL. We only use high-quality birdeye flatback mesh to make these shirts. You can choose whether you want your shirt to have set-in sleeves or raglan-cut sleeves. You can choose if you want to have elastic-cuff or open sleeves. 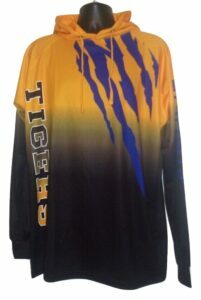 Our basketball sublimated hooded long sleeve shirt sets have an drawstring on the hood. There is the option to choose between an elastic bottom or a drawcord toggle closure. If you want to push your team’s look to the next level, getting one of these shirts would be a great idea. You can get a special quote for your order by getting in touch with us. We promise the best quality at the best price on the market!